This summer was a big one in our family...the Big 3-0 to be more specific. Both my husband and I took the jump into our 30's. His birthday came first, so I took the opportunity to make a big deal out of it and surprise him. Searching online for a party theme brought zero inspiration. All the 30th birthday party decorations I found were either way too cheesy or too focused on 'getting old'. I wanted the party to have a more joyful, celebrating 30 great years vibe. The final look for the party came together when I combined two of my husbands favorite things...bright colors and argyle. The result was joyful, modern, and fit my husband perfectly. 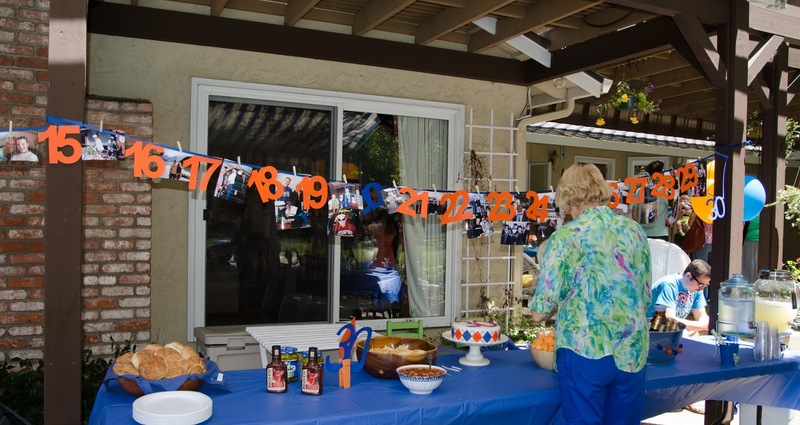 My favorite decoration from this whole party was a timeline of his life. With the help of parents and friends, I collected photos from every year and printed 5x7s at Costco. The pictures were clipped with tiny clothes pins along a blue ribbon with big colorful numbers for each age (cut on my Silhouette Cameo ). Have you ever looked at 30+ photos of one person chronologically? Very cool. I tried to capture all the big events of his life (like meeting me of course!). It gave a great personal feel to the decorations. It was hard to get a picture of the entire timeline :). My second favorite thing about this party was the cake. Apart from being delicious (Mexican Chocolate Cake), the decorations turned out even better than I had pictured in my head. The argyle pattern was crazy easy. I used fondant (which is basically like play-dough for cake, if you are unfamiliar). Using a square cookie cutter (slightly pinched to make it more of a diamond), I cut out the shapes from blue and orange fondant. Then I used some of the chocolate icing from inside the cake to pipe on the dotted lines. 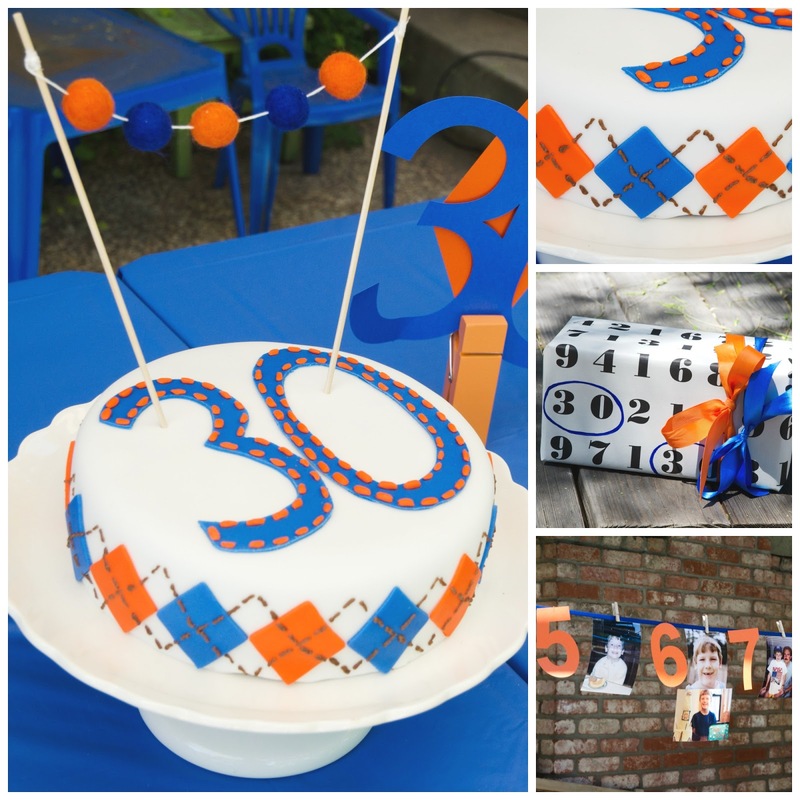 The '30' took the longest as I hand cut the numbers from the fondant and then made the orange detailing also by hand. The cake garland is felt balls strung on embroidery floss and tied to two bamboo skewers. Voila...festive and super easy cake garland. 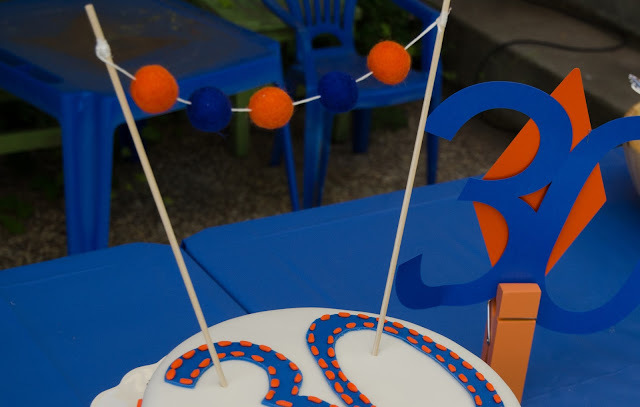 To round off the decorations I added some blue and orange diamond garlands, balloons, and plenty of '30' cutouts hanging from trees. To give a little southern charm we had pulled pork sandwiches, sweet tea, and lemonade. Add in some perfect CA warm weather, a pool, and good friends and it was a birthday to remember.